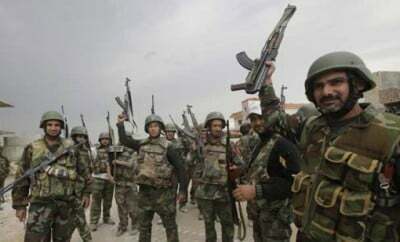 The Syrian Arab Army (SAA) and its allies have been continuing a counter-offensive on the areas of the Aleppo supply line held by ISIS. On Feb.24, the SAA ‘Tiger Forces’ recaptured the vilalge of Rasm al-Nafl and advanced on the outskirts of the Shallalah al-Kabirah village. On Feb.25, the Tiger Forces continued advances and liberated the strategic town of Khanasser. The SAA’s counteroffensive is supported by Hezbollah and Liwaa Al-Quds Brigade and marked by a massive usage of artillery, battle tanks and warplanes. But, according to reports, ISIS and Jund al-Aqsa militants still control about 7 km of the road. In this situation, the Syrian government appears to have paused its major offensive operations in the city of Aleppo. However, the SAA and its allies still have few options to encircle the militants in the area. The Russian Air Force is continuing airstrikes against ISIS, Al-Nusra Front and linked organizations. Russian warplanes have made 62 sorties and destroyed 187 terrorist targets over the past 2 days. Defense Ministry spokesperson Major General Igor Konashenkov noted 10 terrorist strongholds were destroyed and more than 50 militants were neutralized only in the Hama province. Turkey’s President Recep Tayyip Erdogan said on Feb.24 Syrian Kurdish forces must be excluded from a ceasefire agreement between the warring sides in Syria. We remember, Turkey is continuing to shell constantly the Kurdish YPG units which are fighting terrorists in Northern Syria.